The 109° Firebomb offers a 10/0 and a 9/0 blade. 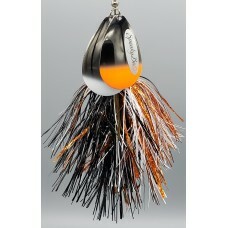 This offset series is the newest addition to the Spanky Baits family of bucktails. A Premier in-line spinner bait that features a new unique offset action that thumps in the water, creating a different turbulence than matched blades. These lures have a crazy action and wobble that attract fish in a big way. The vibration of the offset magnum blades along with the visual addiction of the Flashabou makes this a lure that will go down in history. All this lure does is catch monster fish! Each bait is handmade in the USA! Heaviest stainless steel through wire you will find on any muskie lure. Over 100 color tail patterns made with high quality, commercial flashabou. (2) Super Durable 7/0 treble hooks.